There are certain medical situations that require blood thinners, such as high blood pressure and heart disease, but natural blood thinners are also an option to consider before taking pharmaceuticals. Blood thinners are needed at times to help the blood flow more freely throughout the body and to prevent blood clots in the veins and arteries by slowing down how long it takes for a clot to form. A blood clot can cause a traffic jam of sorts in the body, leading to arterial or venous congestion and potentially causing strokes and heart attacks. The main goal of blood thinners is to prevent pulmonary embolism and pulmonary thrombosis. The clotting of blood is a necessary function of the human body. When a blood vessel is injured, the body works to seal up the wound to prevent bleeding out; obviously, loss of blood can be life-threatening. Platelets and proteins in the blood bond together to stop bleeding by forming a clot over the site of the injury; clots can happen in both veins and arteries. When Are Blood Thinners Required? Some people make clots too readily, and this can be a problem if the clots break off and travel through the bloodstream to the lungs, brain, or heart, which can cause pulmonary embolism, stroke, or heart attack, respectively—all of which can be deadly. Deep vein thrombosis (DVT) is a blood clot that forms in a major vein in the leg (this is less likely to occur in an arm), which then detaches and travels through the heart to the lungs where it can become stuck, causing inadequate blood flow, that is, a pulmonary embolism. Blood thinners are needed to prevent these types of clots from forming. They thin the blood to keep blood cells from sticking together in your arteries and veins. It may be worthwhile to consider options from a natural blood thinners list rather than taking a blood-thinning drug, but always consult with your doctor first before opting for a natural remedy. All blood thinners, natural or not, come with side effects—for example, you might find that wounds are taking longer to heal and that you bruise more easily than you used to, so take them with caution. Used in Indian cooking for thousands of years, turmeric is the spice that gives curry its yellow color. 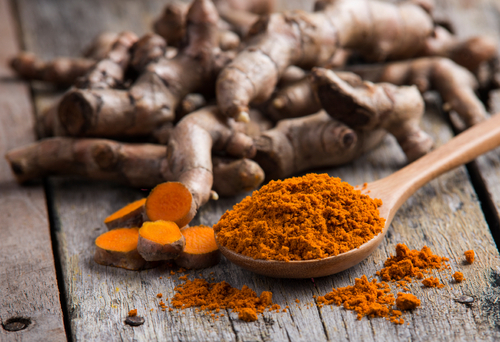 The active ingredient in turmeric is curcumin, which contains blood-thinning and anti-inflammatory properties that help prevent platelets from forming clots. A 2012 study found that daily turmeric consumption may help people maintain anticoagulant status. Ginger is another one of the better natural blood thinners, and can reduce blood clot formation. Ginger contains a natural acid known as salicylate, which has blood-thinning potential. A synthetic version of salicylate is made into aspirin (acetylsalicylic acid). One study found that dried ginger would inhibit platelet aggregation when added to a fatty meal with butter. This is why it is a good idea to use dried or fresh ginger on a regular basis in juices, cooking, or baking. Cinnamon contains coumarin, which is a powerful anticoagulant that can lower blood pressure. Some studies have suggested that long-term use of cinnamon can cause liver damage, so discuss with a naturopath how much is enough to be effective. These peppers also have high levels of salicylates in them. They thin the blood, lower blood pressure, and increase circulation. That being said, cayenne pepper is quite spicy; therefore, many can only tolerate it in small amounts. Garlic has sulfur-containing compounds like allicin, adenosine, and paraffinic polysulfides, which can act as natural blood thinners. A 2007 study found that odorless garlic powder demonstrates antithrombotic activities, and as a result, it may decrease blood clot formation. Other studies suggest that garlic may thin the blood; however, the effects are thought to be small and short-lived. At the same time, high doses of garlic should not be taken seven to 10 days before a planned surgery due to its antithrombotic properties. Garlic can be taken dried, powdered, as a clove, or in supplement form. Ginkgo biloba (Salisburia adiantifolia) is natural plant extract that has been used in traditional Chinese medicine (TCM) to heal various health issues for thousands of years. Ginkgo biloba is able to thin the blood, and it also has fibrinolytic effects, which means this plant may be able to dissolve blood clots. One 2005 study published in the journal Experimental & Clinical Cardiology found that ginkgo extract has similar effects to the anti-clotting drug called streptokinase. Ginkgo biloba is available in capsules, tablets, or fluid extract, dried leaf, and tincture form. Bromelain is an enzyme extracted from pineapple. It is known to be effective for heart health and high blood pressure. Research published in the journal Biotechnology Research International in 2012 suggests that bromelain can break down blood clots, reduce clot formation, and thin the blood. Bromelain can be purchased as a supplement from drug stores or health food stores. Since it helps prevent blood clots, it is best to be careful about consuming lots of pineapple or bromelain supplements while taking blood-thinner drugs. Also avoid bromelain after surgery since it can increase your risk of bleeding. Grape seed extract is made by removing, drying, and pulverizing grape seeds. Grape seeds are high in antioxidants, especially flavonoids, anthocyanins, phenolic acids, and oligomeric proanthocyanidin complexes (OPCs). Grape seed extract is able to prevent and treat disease, and has been found to improve blood flow, reduce blood pressure, and protect blood vessels. Grape seed extract may also work like a blood thinner. Consequently, this supplement is not recommended for people with blood disorders, or those about to have surgery or who take blood-thinning drugs. Feverfew (Tanacetum parthenium) has been used since the time of ancient Greece for treating various health problems, including inflammation, swelling, and headaches. Feverfew may also act like a blood thinner through inhibiting platelet activity and preventing blood clots. Feverfew is available in liquid or capsule form. Beetroot is another one of the more significant natural blood thinners. The nitrates in beets are known to improve heart health and reduce blood pressure. Beetroot is also able to relieve blood clotting. One 2008 study found that consumption of beetroot juice increased nitrate levels and reduced platelet aggregation. The trans-resveratrol and quercetin in red wine have protective effects against atherosclerosis, or coronary heart disease, and they also act as natural blood thinners. This means having a glass of wine once in a while may not be a bad idea. Dark chocolate is high in cocoa and flavonoids, which can help thin your blood. Research shows that dark chocolate can inhibit platelet aggregation, while white and milk chocolate contain less cocoa and therefore do not have a significant effect on blood clotting. Dark chocolate may have a role in the prevention of thromboembolic and cardiovascular diseases. The flavonoids in grapes, such as quercetin, kaempferol, and myricetin, have blood-thinning properties. A study published in The Journal of Nutrition in 1998 confirmed that these flavonoids in grapes have blood-thinning effects. Other studies have found these flavonoids to inhibit platelet aggregation. As a result, eating grapes regularly can help protect your heart. Dan shen root, or red sage, is a traditional Chinese herb often used for circulation and heart problems such as chest pain, high cholesterol, high blood pressure, atherosclerosis, and ischemic stroke, which is caused by a blood clot in the brain. Dan shen is able to thin the blood as it can prevent blood and platelet clotting. This herbal remedy can also cause blood vessels to widen, and this is what improves circulation. However, be sure not to use dan shen when taking blood-thinner drugs like warfarin and anticoagulant and antiplatelet drugs. Dan shen may reduce blood clotting, and taking this herb with these medications may increase the risk of bleeding and bruising. Just be sure to follow the recommended doses for each natural blood thinner and have a discussion with a health practitioner before taking them, as they can interact with other medications. Also, don’t take several of them every day—the results could be disastrous and the blood may be thinned far more than is healthy. Use caution and common sense. What about natural blood-thinning food? There are certain foods that are natural blood thinners. Two other sources of natural anticoagulants are foods abundant in vitamin E and omega-3 fatty acids. Using the natural blood thinners in food can be a good alternative to conventional medications. Ginger High in salicylates. Use as a capsule or grate the root to make a tea. Cinnamon Powerful anticoagulant, thanks to its coumarin content. Use in foods regularly or buy in a stronger concentration as a capsule. Turmeric Has curcumin, which prevents platelets from forming clots. Found in curries, but can be used on its own in a drink with warm milk and honey. Take every night. Cayenne pepper High in salicylates. Be careful with how much you use, because it can cause flushing and gastrointestinal discomfort. Vitamin E Natural anticoagulant found in many foods, such as spinach and broccoli. Omega-3 fatty acids Makes blood less prone to clotting. Eat sources rich in omega-3s such as salmon and other fatty fish, and nuts including walnuts. Garlic Has sulfur-containing compounds, which can act as natural blood thinners. High doses should be avoided seven to 10 days before a planned surgery due to its antithrombotic properties. Ginkgo biloba Ginkgo biloba is a Chinese herbal remedy able to thin the blood and dissolve blood clots. It is available in capsule, fluid extract, tablet, dried leaf, and tincture form. Bromelain This enzyme can break down blood clots, reduce clot formation, and thin the blood. Be careful with bromelain supplements and pineapple intake when taking blood-thinner drugs. Grape seed extract This supplement is high in antioxidants, especially flavonoids, anthocyanins, phenolic acids, and oligomeric proanthocyanidin complexes (OPCs). As a result, it has the ability to thin the blood, reduce blood pressure, improve blood flow, and protect blood vessels. Feverfew Able to act as a blood thinner through preventing blood clots and inhibiting platelet activity. Beetroot The nitrates in beets have heart health benefits, such as reducing blood pressure. Beetroot is also able to decrease blood clotting. Red wine The trans-resveratrol and quercetin in red wine act as natural blood thinners, and help protect against coronary heart disease. Dark chocolate High in cocoa and flavonoids, which help it act as a natural blood thinner. Grape Contains flavonoids such as quercetin, kaempferol, and myricetin, which all have blood-thinning properties. Dan shen The Chinese herb known for treating circulation and heart problems is also able to thin the blood since it can prevent blood and platelet clotting. This herbal remedy can cause blood vessels to widen as well, and this is what improves circulation. How Much Blood Thinner Consumption Is Safe? If you are taking a well-known medication like Coumadin, which is the best on the market for thinning blood, you need to be careful about supplementing it with natural remedies because that can lead to thinning the blood too much, which can in turn lead to other health issues. If you’re taking a blood thinner, you can supplement it with no more than 400 IU of vitamin E per day. Do not take aspirin or Ginkgo biloba, and be sure to consult with your doctor before using any blood-thinning supplements. Blood thinners are drugs used for heart problems such as heart disease, high blood pressure, and blood clotting. In this article, we went through some of the best natural blood thinners you can use, including turmeric, ginger, cinnamon, cayenne pepper, vitamin E, omega-3 fatty acids, garlic, ginkgo biloba, bromelain, grape seed extract, feverfew, beetroot, red wine, dark chocolate, grape, and dan shen root. It is important to remember that all blood thinners, even the natural blood thinners, have side effects that may cause you to bruise or bleed more easily. Therefore, use them with caution, especially if you’re taking other medications. It is a good idea to work with a natural health practitioner with experience treating heart problems such as blood clotting. Blood Clots,” Hematology web site; http://www.hematology.org/Patients/Clots/, last accessed March 30, 2016. “7 Types of Natural Blood Thinners to Improve Circulation and Reduce Inflammation,” The Science of Eating web site; http://thescienceofeating.com/2015/01/30/natural-blood-thinners/, last accessed March 30, 2016. “The Most Common Blood Thinners,” Dr. Sinatra web site; http://www.drsinatra.com/the-most-common-blood-thinners/, last accessed March 30, 2016. Kim, D.C., et al., “Anticoagulant activities of curcumin and its derivative,” BMB Reports, April 2012; 45(4): 221-226, PMID: 2253131. Verma, S.K., “Effect of ginger on platelet aggregation in man,” The Indian Journal of Medical Research, Oct. 1993; 98: 240-242, PMID: 8119760. Fukao, H., et al., “Antithrombotic effects of odorless garlic powder both in vitro and in vivo,” Bioscience, Biotechnology, and Biochemistry, Jan. 2007; 71(1): 84-90, PMID: 17213677. Naderi, G.A., et al., “Fibrinolytic effects of Ginkgo biloba extract,” Experimental & Clinical Cardiology, Summer 2005; 10(2): 85-87, PMID: 19641664. Pavan, R., “Properties and Therapeutic Application of Bromelain: A Review,” Biotechnology Research International, Dec. 2012; 2012: 976203, doi: 10.1155/2012/976203. Webb, A., et al., “Acute blood pressure lowering, vasoprotective, and antiplatelet properties of dietary nitrate via bioconversation to nitrite,” Hypertension, March 2008; 51(3): 784-790, doi: 10.1161/HYPERTENSIONAHA.107.103523. Pace-Asciak, C., et al., “The red wine phenolics trans-resveratrol and quercetin block human platelet aggregation and eicosanoid synthesis: implications for protection against coronary heart disease,” Clinica Chimica Acta, March 1995; 235(2): 207-219, PMID: 7554275. Innes, A., et al., “Dark chocolate inhibits platelet aggregation in healthy volunteers,” Platelets, August 2003; 14(5): 325-327, PMID: 12944249. Osman, H., et al., “Grape Juice but Not Orange or Grapefruit Juice Inhibits Platelet Activity in Dogs and Monkeys (Macaca fasciularis),” The Journal of Nutrition, Dec. 1998; 128(12): 2307-2312, doi: 10.1093/jn/128.12.2307.